Runs and a standard 20 lbs propane tank, hides in the base. This patented design flame heater comes with a powder coated steel shell. Comes with anti tip over protection system for your safety. The Square Bronze Patio Heater is the perfect way to extend your backyard entertaining season. This unique unit produces 46,000 BTU using a standard 9.1 kg (20 lb.) propane tank and includes wheels for easy mobility. The stylish bronze colour and modern square design perfectly accent and enhance your patio decor. This patio heater includes a tip-over protection safety feature and reliable Piezo igniter. 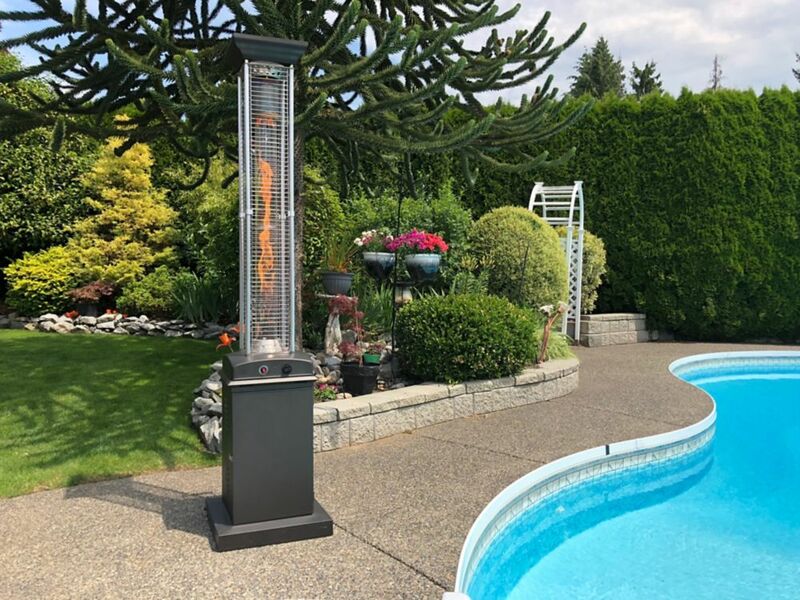 Full Size Square Flame Propane Patio Heater This patented flame heater brings a new dimension to outdoor decorative space heating. The transitional design allows this patio heater to seamlessly blend into any patio decor, while offering dancing flames that bring any outdoor space to life.